Our Tutors Have Helped Students Succeed for Over Two Decades. Club Z! Tutoring has over 400 franchise locations helping students succeed every single day. Our tutoring programs and curriculum are unmatched in the industry not only due to their years of development, but because of our unbelievable tutors. Our tutors are certified, and professional, which means your student gets the perfect tutor every-time. Our tutors work one on one with your student in the comfort of your own home, and also correspond with teachers at their school. After 20 years in the tutoring industry, we’ve learned a few things about what it takes to help students succeed. 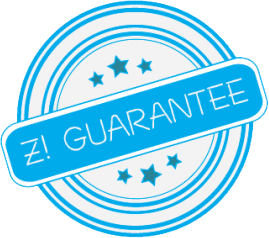 Sure, we may be biased, but we truly believe that no other tutoring company cares as much about its clients, or goes to as much trouble to ensure their satisfaction and success as Club Z! Tutoring. Our personal touch is evident in everything from the initial consultation with you and your child to the placement of a perfectly matched tutor. This commitment to quality and academic success truly makes The Club Z! Difference. Our tutors are thoroughly screened and background checked prior to hiring. Through our proprietary “Z! Tutor Match” system, we go to great lengths to match them with students based on personality, learning preferences, and academic strengths and weaknesses. And with our “Z! Guarantee” you get the right tutor every time, guaranteed! Our proprietary Z! Tutor Match process ensures that we match the right tutor to your child every time! In fact, we’re so confident that you’ll love our tutors, we guarantee the match. Through our Z! Guarantee program, if you are unsatisfied with the tutor selected for your child, simply let us know and we’ll make a more suitable match ASAP. It’s that simple! How can we be this confident? Academic Strengths: Our tutors are experts in their subject area(s) and are matched with your student based on his/her academic weaknesses. Many of our tutors are certified teachers, and all possess an educational degree and relevant tutoring experience. In addition, all are thoroughly screened and background checked prior to receiving a student assignment. Availability: Our tutors are matched with your student based on your scheduling preferences. Whether it’s after school, weekends, evenings, or during academic breaks, our tutors can accommodate even the busiest academic or athletic schedules. Personality: We match our tutors with your student based on complementary personality traits. The introduction of an encouraging third party with whom your student can relate can often restart a fresh flow of learning. Plus, the same tutor will teach the child every time so that rapport can develop. Teaching Style: Our tutors are matched with your student based on his/her preferred learning style. Our tutors are effective because they understand the personality, interests, and learning style of their students. We believe that when a student is seen as a whole, both learning and self-esteem can flourish. Below, is just a few of the subjects our tutors can help your student learn. If you have any questions, or would like to speak directly with an educational consultant, please call 800-434-2582 or fill out the form above! Pre K Tutoring with a Club Z! Tutor. Club Z! tutoring offers a complete pre k tutoring readiness program. With Club Z!’s proprietary kindergarten readiness program, we will help your child prepare for their first big day! Our proprietary Let the Learning Begin™ pre k tutoring program makes preparing for kindergarten as easy as 1-2- 3! Foreign Languages Tutoring with a Club Z! Tutor. Club Z! tutoring offers foreign languages tutoring in a variety of languages. Whether you are taking Spanish in school or want to learn Mandarin Chinese for personal/business reasons, Club Z!’s foreign language tutoring has the foreign language tutors you need to help you master a second language. Science Tutoring with a Club Z! Tutor. Club Z! in-home and online science tutoring provides individualized instruction in all scientific disciplines, including earth/life science, biology, chemistry, and physics. Our science tutors work hard to ensure that each student has the knowledge and learning in science that will lead to future success.